Today, I would like to demonstrate an example of painting with layers using the impasto technique and a palette knife. I did this painting many times on different surfaces: canvases, special paper for oils, and cardboard. I recommend you to use a surface that you are more familiar with. You will need a palette knife. The palette knife size also depends on the canvas/paper size you will use. You will need some special oil paints. You can see a list of supplies and links on the right side of the screen where you can get them. You can also use your own paint mixtures. Personally, I love to experiment with new colors I can find online or at local stores. I just covered the white canvas with every dark colored oil paint what I had left from previous paintings using my palette knife. I always use my leftovers for the next canvas preparation. It can also be dark acrylic gesso. Allow it to dry completely before moving to the next step. Gesso will dry much faster than oil paint, so it is really your choice. Sometimes, I paint over other works that didn't come out good for me and use it as a first layer of a painting. Step 2. Layer 2. Background. Using a palette knife, I applied some light blue on the left and right upper corners. I added some yellow ochre in the middle. I applied some green grey down, crab grey in the center, and a mixture of white, ultramarine, and green grey. 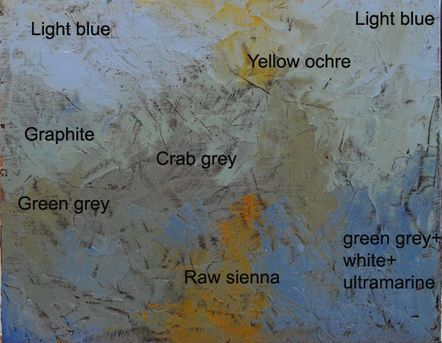 Raw sienna was applied at the bottom of the canvas. I mixed some of these paints straight on the canvas. You can see the links of the exact oil paints I used on the right side of your screen. You can also find them in local stores such as Hobby Lobby. I made the first layer possible to see through. Step 3. Layer 3. Some dark applied. 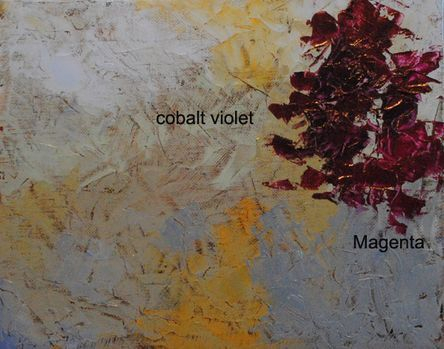 Using a palette knife, I applied Cobalt Violet and Magenta on the canvas to create some dark areas. After doing this, I immediately started to work with light colors. I didn't wait for the canvas to dry. Step4. Layer 3. Some light color added. 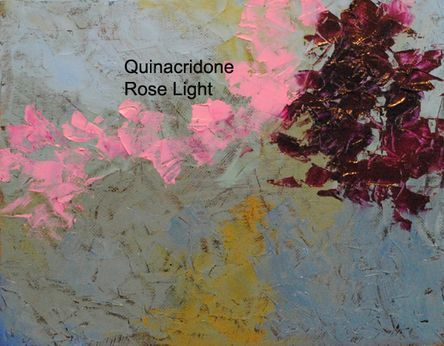 I used Quinacridone Rose Light oil paint as the lightest shade of pink on this canvas. Step 5. Layer 4. Adding dark red. I started to work with medium dark red color values. 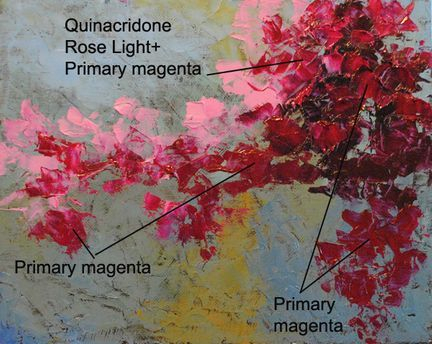 I mixed some Quinacridone Rose Light and Primary Magenta for the upper right corner of the painting. 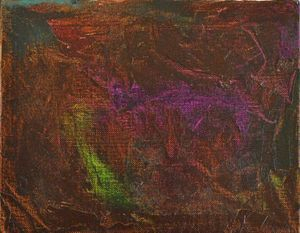 I used Primary Magenta for other parts of the painting. Sometimes, I mixed colors straight on the canvas. After that, I decided to wait for the paint to dry. Step 6. Layer 5. Adding flowers. 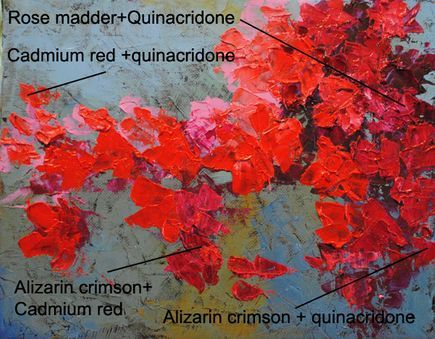 After my painting dried out I started paint flowers using mixture of Cadmium Red and Quinacridone Rose Light. 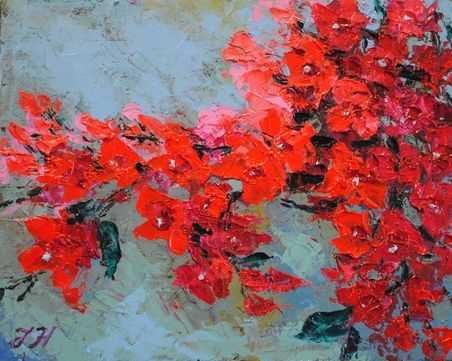 I use only the palette knife. 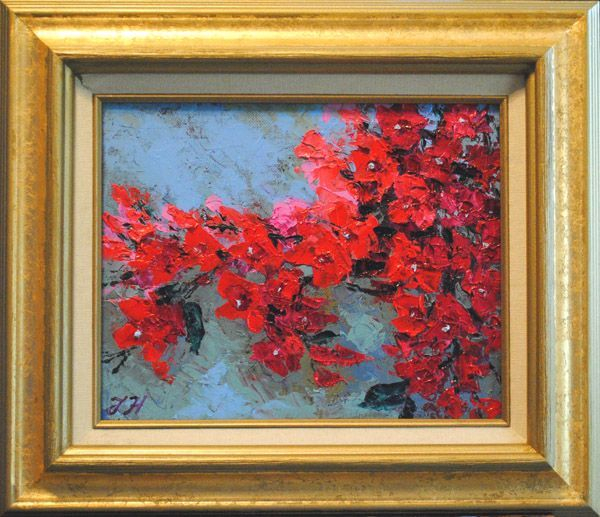 Remember that bougainvillea flowers usually have three petals. Step 7. Layer 5. More Flowers. 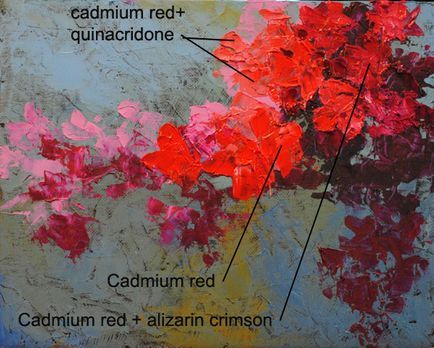 I continued to paint flowers using more paint mixtures of Rose Madder, Alizarin Chrimson and Quinacridone Rose Light. Step 8. Layer 5. Defining flowers. 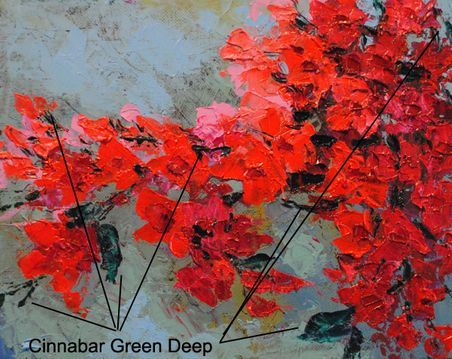 It is time to work with the flowers to define them and to add some depth. I added darker values in the middle of each flower, and I defined the shape of each flower using Cinnabar green and Magenta to apply around and between the flowers. Step 9. Layer 6. Light and shade. 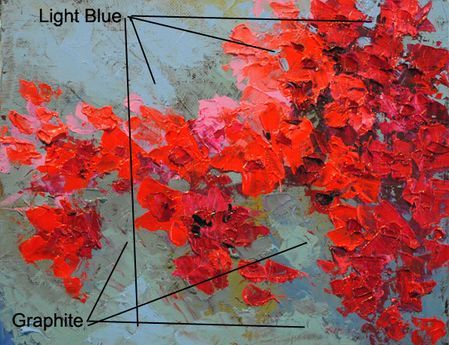 Since I painted the bougainvillea climbing the wall, I have to paint shade on the wall from the flowers. I used Light Blue and Graphite for lighter areas of the painting, and I used Crab Grey for shaded areas. Step 10. Layer 6. Leaves and branches. It's time to add leaves and branches to our bougainvillea vine. 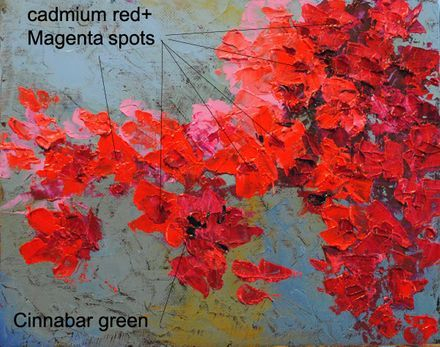 I used the darkest value of green I could find: Cinnabar Green Deep oil paint. If you don't have it, add some black and violet to whatever green paint you have. I only used a palette knife. Step 11. Layer 6. Final details. I added Light Blue dots to each flower, and I added a signature. So far that's all. I hope you enjoy your painting!